We get up early, tip toe out the front door. We drive. The lingering expectation, the dew on the grass, the muted adrenaline in our legs - it feels like stolen time and space. We are now at the trailhead, minutes away. We take a few steps, quicken the pace. Across some single-track flats with sagebrush nipping at our calves, up a brief hill, then down switchbacks to a stream dotted with small pines and cottonwoods. We relax. Running has descended upon us. An old trail and an old friend revisited. But let's not get romantic. A trail is never, ever your friend. 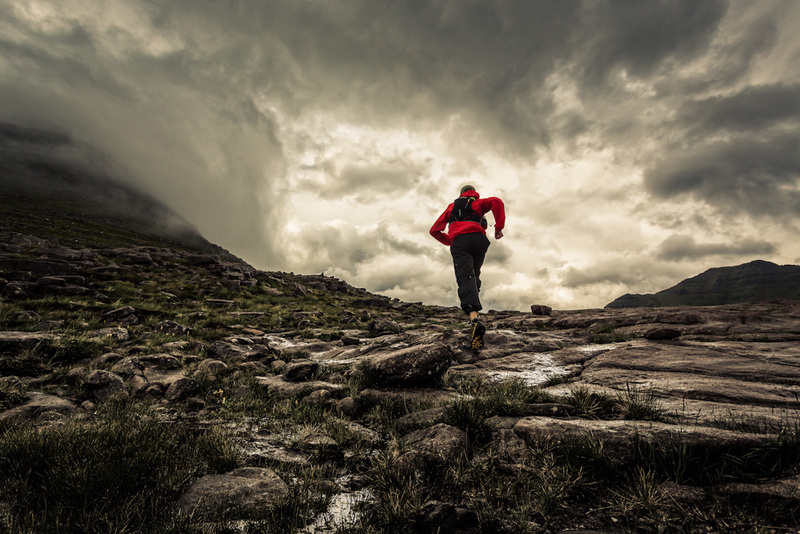 What goes by the name of "trail running" is a genre of movement occurring between two living things - between a living, breathing organism (you) and another living, breathing organism (the eco-system). Trail running is therefore a third thing that happens when a body decides to move on a trail that is also "moving." Movement does not start when one begins running. Movement is happening all of the time, in all places, all around us - when you are sleeping, your chest is rising and your body is digesting, metabolizing and fighting off viruses, sometimes with frenzied panic. Also while you are sleeping the talus slope of a mountain may have slid from a midnight storm, the rain greasing the boulders just enough for gravity to express itself. A tree may have fallen over your favorite stretch of downhill. 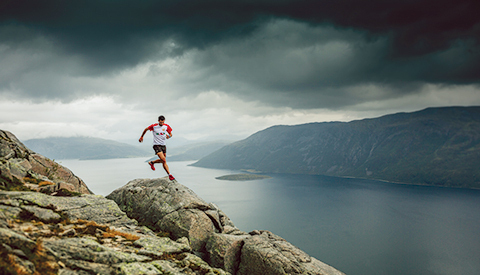 A trail has changed and so has the way you run it. When "in" this genre of movement, we are a body-trail couplet, i.e., a trail runner. It's a fragile, unique type of movement because of the fact that geological time moves so slow and our bodies change so fast. A trail does not age like you. Running a hill in your twenties is not the same as running that hill in your sixties, and, while you are a different person running for different reasons, the trail 'appears' virtually unchanged. It still charts the same path through the land, still is damp in the morning in the same troughs, receives shade at the same time every afternoon, and, while a few stones have shifted, there it is laid out on the earth's surface like an unchanging, fallen ribbon. And yet, a trail is akin to a wave, though it is born and crumbles over a longer period of time. Oftentimes, the only human recognition of a shifted boulder on remote trails is in the patterns of the runners - our moves record a changing earth. It is a sad truth that we get to know trails for such a short period of their life. But trails don't care for us. If the majority were given the opportunity, they would allow nature to swallow them up completely, should the trail go unused. Nature is cruel, and lest you think it isn't, trail running in the places we do today would be mostly unthinkable in an era where we were not at the top of the food chain. The serene joys of trail running come from the safety we feel of passing through its timbers or open sky unharmed, a protection from hostile animals or unfriendly tribes. If anyone ever wrote a history of trails, they would first find animal trails lacing through dense forests and jungles and savannas. These trails would lead to water, reveal migration patterns, and they would always be the result of a natural intelligence - animals and pre-humans in the struggle to survive. Short trails might lead to food sources, while long trails would be tied to seasons and migration patterns, like the Ute trails in the Colorado Rockies. People would have also avoided making trails, for safety. Then, with civilization, trails widened, grew offshoots, followed water and coastlines, led to settlements. Trails got paved, then, after we invented things to put on trails, they turned into roads, then highways. Mainly due to the fact that too many trails had been converted to roads, an amazing thing happened - a government set money aside to build trails in the mountains of North America. National parks were born, "America's greatest idea," and with them, more trails. Trails even have legislation passed just for them, such as the National Trails System Act of 1968. Trails got names, reputations, and became destinations in themselves. When something gets a name, it comes alive in a new way and we think we know it better. But that is unfortunate, since trails should be anonymous. Trails are not like old friends we visit. Trails care nothing for us. You may be connected to it, and have your memories stored in its trees and creeks and undulations but it is not beholden to you. Like nature writ large, it is an unfeeling slice in an otherwise uncaring wilderness. It cares little if you run on it. This does not mean you simply "project" all meaning onto a trail, that a trail has no meaning; it, too, has its own language. The joys of a trail runner are fleeting, completely impermanent, and unique to each step. We do not so much act on a trail as much as it acts on us, as if we were its instrument. Perhaps its place, the land on which a trail lives, is trying to survive, like us, and that it is reaching out to us for its survival, just as we need it to survive. Trail running is disorderly music, an unholy marriage - the landscape records itself in us, in our heartbeat, muscles, tendons and lungs, and, if only for seconds the time of our life and geological time come together, and we move within it. Sometimes its romantic, sometimes we just get abused. Does it matter?